“It is easier to ridicule than to investigate, but not as profitable." The ‘Queensland Flying Saucer Bureau’ (now known as UFO Research Queensland) was established in 1956 with its first constitution being brought into effect in 1961. The Bureau invited George Adamski to visit Australia in 1959 and so initiated and organised the first of his world tours, during which he lectured on his encounters and displayed his photographs and films. These tours also served to establish a world-wide network known as the ‘Get Acquainted Programme’. During this time the membership of the Bureau rose rapidly to about 200. During the 1960s the Bureau began publishing its own newsletter, now known as UFO Encounter, and continued its sightings and investigation activities. One of the important events of this decade was the UFO sighting and ‘nest’ at Horseshoe lagoon near Tully, Northern Queensland. During the 1970s the activities of the Bureau continued and included a visit by Professor J. Allen Hynek. In 1976 the Bureau changed its name to ‘UFO Research Queensland’ in keeping with similar name changes throughout Australia. During the 1980s membership numbers declined and public meetings were discontinued for a time. Many members had become discouraged by the failure to find answers to endless questions, and by the growing ‘strangeness’ of UFO related experiences, most notably abductions. UFO Encounter continued functioning, and began to attack the many scientific puzzles which are entangled within the UFO phenomenon. By the early 1990s membership rose to over 300. The UFO Phenomenon became a matter of public concern in 1947, when witnesses began to publicly declare their sightings and experiences and the media began to report such accounts. As the years passed it became apparent that, for whatever reason, government authorities were doing all in their power to cover up the UFO phenomenon and would not be disclosing information about official UFO sightings, communications, photographs or physical evidence. It was in this context that concerned citizens in many countries joined themselves into voluntary associations for the purpose of investigating UFO sighting reports and placing their findings on record for posterity. These bodies typically established a membership with an executive committee and public and member meetings. It is probably fair to say that initially these associations felt that ‘something’ should be done to place on record the remarkable things that were happening, and only gradually evolved the procedures and rationale we now use. The ‘Queensland Flying Saucer Bureau’ (now known as UFO Research Queensland) was established in 1956 with its first constitution being brought into effect in 1961. Many of the ‘contacts’ with flying saucer occupants which we now regard as classic were made and published in the 1950s. One well known contactee was George Adamski. The Bureau invited Adamski to visit Australia in 1959 and so initiated and organised the first of his world tours, during which he lectured on his encounters and displayed his photographs and films. These tours also served to establish a world-wide network known as the ‘Get Acquainted Programme’. During this time the membership of the Bureau rose rapidly to about 200. Similar groups had also become established in other Australian state capitals and for a period of years a common publication, The Australian Flying Saucer Review, reported on the activities and investigations of these bodies. The 1950s saw unprecedented UFO activity taking place in Papua New Guinea. This was documented by the Reverend Father Gill, amongst others, and published by the Reverend Canon Norman Crutwell. The Brisbane Bureau became closely associated with this work and is still today the body which prints this publication. The Gill Report has been named one of the ten most significant UFO reports of all time. 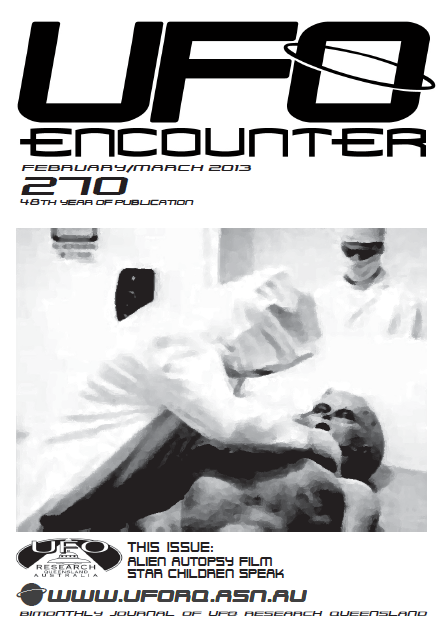 During the 1960s the Bureau began publishing its own newsletter, now known as UFO Encounter, and continued its sightings and investigation activities. One of the important events of this decade was the UFO sighting and ‘nest’ at Horseshoe lagoon near Tully, Northern Queensland. The bureau also hosted Professor James MacDonald, an atmospheric physicist and one of the few qualified scientists who studied the UFO phenomenon seriously. During the 1970s the activities of the Bureau continued and included a visit by Professor J. Allen Hynek. Professor Hynek encouraged the establishment of a national body, ‘The Centre for UFO Studies’, now known as the ‘Australian Centre for UFO Studies’ [ACUFOS]. In 1976 the Bureau changed its name to ‘UFO Research Queensland’ in keeping with similar name changes throughout Australia. The investigation of sightings, public meetings, the publication of its then Newsletter and occasional lectures by prominent UFO personages continued to be the activities of the association. Meetings of members of the various Australian UFO groups were organised by means of UFO conferences, and UFO Research Queensland participated in these events and also hosted them. Throughout, many vexing questions relating to UFOs, the government cover-up, contactees, the quality of UFO research, the keeping of records etc. engaged the attention of many members. All of these and also new ones are still part of the UFO ‘scene’. During the 1980s membership numbers declined and public meetings were discontinued for a time. Many members had become discouraged by the failure to find answers to endless questions, and by the growing ‘strangeness’ of UFO related experiences, most notably abductions. UFO Encounter continued functioning, and began to attack the many scientific puzzles which are entangled within the UFO phenomenon. It also explored many of the key issues implicit in contactee accounts, the Extraterrestrial Hypothesis and the abduction phenomenon. Public meetings were once again established, Branch and affiliated associations came into being, the organisation became incorporated, and by the early 1990s membership rose to over 300. In the 1990s the association hosted a number of guest speakers from the UFO research field including Glen Steckling from the Adamski Foundation, German researcher Michael Hesemann, well known crop circle researcher Colin Andrews, UK crop circle researcher Leonie Starr, Australian contactee Michel Desmarquet and author of ‘Abduction to the Ninth Planet’. Our Sunshine Coast Branch also hosted Robert Morningsky and Palden Jenkins. The 90s also saw the institution of our Investigator Course which provides investigators with the skills and knowledge required to personally investigate a UFO sighting, close encounter or abduction. The association’s Encounter Group was also established soon after a visit to Brisbane by Budd Hopkins in 1992, and provides a regular forum for close encounter experiencers to meet and discuss their experiences, as well as providing coping mechanisms. A comprehensive lending library including books, videos, audio tapes and publications was also established to provide members with resources that may otherwise be unavailable to them. UFORQ also entered the electronic age, establishing its first website at www.briz.net/uforq before moving on to its current domain at www.uforq.asn.au. 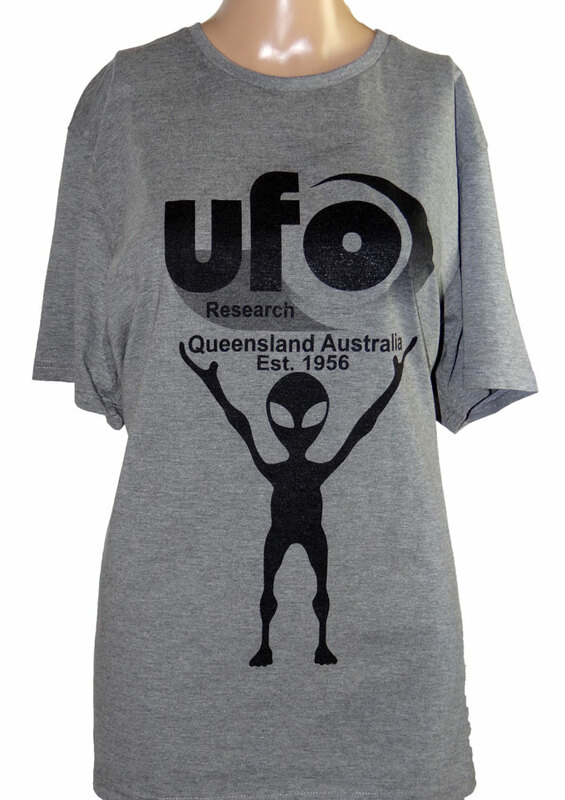 The year 2001 saw the re-instigation of regular national conferences by UFO Research Queensland, beginning with Brisbane and to be held annually across the country, which brought together researchers and UFO organisations, contactees and abductees from around Australia. The 2000s have also seen the commencement of a Contact Project, aimed at finally making contact with ET. The year 2006 was a watershed that saw UFORQ hosting its 50th Anniversary UFO Conference in Brisbane. Guest speakers included international researchers Timothy Good (UK), Glenn Steckling (USA), AJ Gevaerd (Brazil), and Australians Rex Gilroy, John Auchettl, Martin and Sheryl Gottschall, and the original witness to the Tully Nests, Albert Pennisi. UFO Research Queensland Incorporated has striven to establish and maintain a tradition of the highest competence and dedication to the greater good of the people of Queensland, and we want to be there when the great body of hidden information is finally brought into the public domain, where it has always belonged. We await the time when our efforts reach the point where our many questions find the answers they must have.